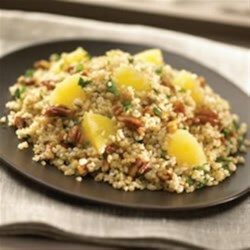 "This bulgur wheat salad with pineapple and fresh basil makes a great lunch or a hearty side dish." Combine water and bulgur in large saucepan. Heat to boiling, reduce heat and simmer covered 35 to 40 minutes or until bulgur is tender but not mushy. Transfer to large bowl; cool to room temperature. Stir pineapple tidbits, pecans, basil, parsley and oil into bulgur. Serve at room temperature.